China continues to make headway in its efforts to become one of the world's foremost spacefaring nations. In a white paper issued last week, the Chinese government officially announced its intentions to place a manned spacecraft on the moon. According to the announcement, a manned lunar mission would be just one stage in the country's "three-step" deep space development plan (the other two steps involve placing satellites in the Moon's orbit and returning lunar samples to Earth), and reflect the country's goal to "push forward...and make new technological breakthroughs, creating a foundation for human spaceflight." Chinese officials have yet to announce a rigid timetable for placing an astronaut on the Moon, but The Guardian reports that such a mission could take place by 2025. And while the prospect of any human in deep space is definitely exciting, the fact that a manned return to the moon is being mounted not by the U.S., but by China, has some people speculating about the future of American space efforts. In my opinion, China understands what it takes to be a great power...They are a near-peer competitor of ours and I would worry very much about the future of this nation if we were not — and if we were not seen by all — to be a world leader. 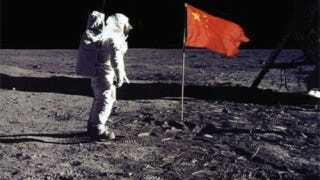 When the Chinese can reach the moon and we cannot, I don't see why any other nation would regard us as a world leader. "Assuming the Chinese are serious, which recent history suggests they are, then I believe the impact could be game-changing," said Ken Pounds — a leading researcher at the UK's Leicester University — speaking to the effect that a Chinese push for a manned lunar landing might have on the U.S. space program. "It is very unlikely the U.S. would not respond," he said. "That could breathe new life into their space exploration programme, which is currently going nowhere."